Now that the Solstice festival commonly called Christmas is over and the discarded trees are appearing on the kerbs, the Church’s celebration of the Incarnation, which confusingly is also known as Christmas, has begun and we can more easily pay attention to what God is saying to us through its stories and themes. The evidence that they are two unrelated festivals is nowhere more obvious than in today’s scripture readings. Surely there is no story that clashes more violently with the shop window image of Christmas than the story we heard tonight from Matthew’s gospel with its murdered toddlers and inconsolable mothers and refugees fleeing from murderous death squads. I don’t know whether those who compiled the Church’s cycle of Bible readings were deliberately aiming to shock us out of the tinsel strewn sentimentality of the past month, but any serious listening to these stories would certainly be a fast remedy. In the story we heard, King Herod is tipped off that a baby has been born in Bethlehem and that this baby is believed by some to be the one who will be the long awaited Messiah. Herod is under no illusions that the Messiah is some purely spiritual title. He knows perfectly well that if the people start following a Messiah, they will stop bowing down to the ruling authorities. And so Herod is not going to allow any upstart Messiah to start fracturing the unquestioning obedience that he currently enjoys from his fearful subjects. 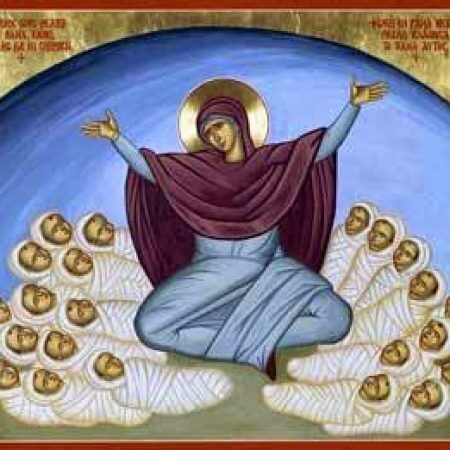 But unable to identify the exact baby, Herod simply dispatches a death squad to kill all the boys under the age of two in the village. It is simple, brutal, chilling. Many historians question whether this incident ever really happened because there is no record of it in any historical source other than the Bible, and even there it is only recorded in one of the four gospels. I’m not in a position to know better than anyone else, but the fact that there are no other records of it does not persuade me that it is doubtful. The population of Bethlehem at the time was probably no more than about two hundred. It’s a village, not a city. If twenty children had been murdered somewhere in Australia or some other developed western country this week, we’d have all heard about it for sure. But if twenty children were killed in Sudan or Syria or North Korea there is every likelihood that the news wouldn’t have registered as significant, and if it had happened in Afghanistan, it probably would have been hushed up. That’s in the age of the internet and instant global communications. There is little reason to imagine that a military unit disposing of maybe twenty children in a small village in an obscure outpost of the Roman empire would be widely reported or even considered particularly unusual. These sorts of thing happen regularly today, and we don’t hear about them. How much more so in the ancient world. But such stories, however widely reported, raise some tough questions about God, don’t they? How can God allow such atrocities? How can God stand by and allow innocent children to be butchered and forgotten? Is God really a God of love? Can God be trusted? If God is supposed to be bringing about a reign of love and peace and justice, what on earth is God doing allowing murderous tyrants like Herod to do as they please unchecked and unpunished? Well, believe it or not, the Christmas stories do begin to respond to these kind of questions, and this week’s stories in particular. The whole of the gospel story speaks to these questions, but it starts right here at the beginning. And it starts, and continues, by first challenging what we think God should be doing about it. In the popular Exodus stories that every Israelite kid was raised on, the oppressor was the king of Egypt and the one who struck down the first-born children was God. Thus we had the image of a God who met violence with violence. So now, when the roles are reversed and it is the oppressive king who kills the children, we look for God to meet violence with violence – a celestial peace-keeper, armed to the teeth to guarantee the security of the fearful people. Both the other readings today hinted at such an expectation, because we usually link this expectation with the image of the guardian angel or the avenging angel. The angels were seen as the armies of heaven, and that’s what we tend to want. If Herod dispatches the death squads, we want God to dispatch the Hosts of Heaven to stand guard over the people and again cast the cruel soldiers into the sea so that we can dance in triumph on the beaches to the strains of Miriam’s song that gloats over the washed up bodies of the Egyptian soldiers in the time of Moses. Jesus had to become like his brothers and sisters in every respect, so that he might be a merciful and faithful high priest … Because he himself was tested by what he suffered, he is able to help those who are being tested. So right from the start of the Jesus stories we are hearing a new message, a message that challenges our desires for a powerful avenging God who overcomes violence by even greater violence and imposes peace with an iron fist. So sorry, but if what you are wanting is a God of extreme force who will smash the bad guys and guarantee that nothing harmful will ever reach you, Jesus is going to disappoint you. That is not the God who Jesus makes known to us. And you know from experience that no amount of strenuous believing ever guarantees immunity from harm. Even the best Christians suffer. Just look at Jesus – hunted at birth and humiliated at death. But would that be the sort of peace we really want anyway? If you’ve ever travelled in war torn or heavily militarised countries where there are heavily armed soldiers constantly patrolling the streets “for your protection”, you will know that their presence gives only a tenuous sort of feeling of safety. The sort of peace and security that are based on the present balance of power being tilted our way and constantly exhibited by the show of weapons in the street is not actually the vision of harmonious peace with justice that we all long for. And it is not the sort of peace that God stepped into his own creation as a vulnerable baby to bring. What the writer to the Hebrews calls “the pioneer of our salvation (being made) perfect through sufferings” is seen already in the stories surrounding Jesus’s birth. He faces the violence and oppression of the world in vulnerability and humility. He is identified with his brothers and sisters in suffering the brutality of the world’s murderous power-brokers. While he himself slips through the fingers of death on this occasion, it is only as a refugee, and it is only a matter of time before the world’s murderous power-brokers catch up with him and string him up to die. But the work of salvation has begun. God, in love and pity, in mercy and in the abundance of his steadfast love, has come among us, flesh and blood, to unmask the violence and oppression and to bear it in his own body all the way to the cross, that we might be free and that peace might truly come. And so with him who in suffering calls us his brothers and sisters, we carry our Advent prayer on into this Christmas season: “for the coming of that day on this, we work and pray. Come, Lord Jesus.” Amen.